In a large bowl mix cheese, buttermilk, vegetable oil, eggs, corn and green chiles. In another bowl mix cornmeal, all-purpose flour, baking powder, baking soda and salt. Add to cheese mixture; stir just until dry ingredients are moistened. Generously spray a 1-1/2 quart casserole dish with cooking spray. Pour mixture into casserole. 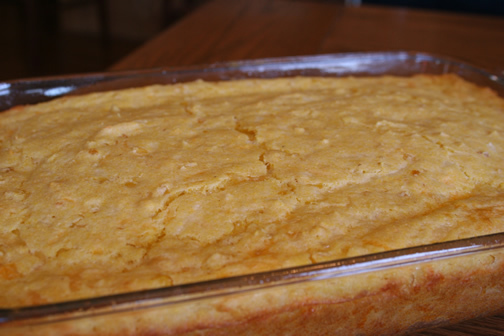 Bake 40 to 50 minutes in a 375 degree oven or until cornbread is a deep golden brown and toothpick inserted in center comes out clean. Cooking times are going to vary based on width and height of the pan you use. Cool in the pan 10 minutes and slice into wedges. Serve warm. Drench in honey and butter if you desire.